Holy cow you guys, I'm doing the MAELSTROM tonight, for the third straight year. If you don't remember from two years ago when I WON THE CONTEST, it's part of WNEP Theater's SKALD story-telling festival. 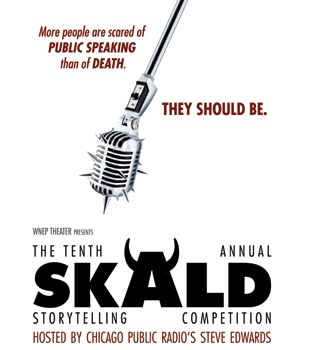 The SKALD* (tomorrow night) and Kid's SKALD (last night) feature story-tellers telling prepared, rehearsed stories. The MAELSTROM is improvised story-telling. Six of us (which is mostly the NGPC) will tell stories based on audience suggestions in three rounds. The winner gets some sort of prize. For years it was very important to me as an improvisor that the audience knew that I was improvising and that I knew for myself that I wasn't creating any of the scene until my foot hit the stage in that-exact-instant. But over time I got a lot more relaxed about it -- some audiences, I've learned, will, for whatever reason, assume that you're doing prepared material no matter how much "proof" you offer them. And for myself, I learned that it didn't matter how many ideas are floating around in my head as I approach the stage, as long as I react honestly and respectfully to what my scene partner(s) is bringing to the scene. The one place I still have some it's-got-to-be-improv nervousness left is the MAELSTROM. Because there's no partner to keep me honest. So in the days leading up to the show, I'll have dozens of stories swirling in my head. I mean, I live surrounded by stories. I think, now, it's just better to let them come -- the more I try to push them away the more I remember them. But I just need to trust myself, and if you come see the show, you'll just have to trust me that it's all made up.